Defending 1 v 1 in the center channel. Player 1 passes to play 2 creating a new angle for the defender. Defender sprints to meet the attacker as high as possible. Defender works to show the attacker one side while being patient and waiting for an opportunity to tackle. Communication between GK and defender while not falling all the way back into the box. Progression 1: 2 v 1 defending. 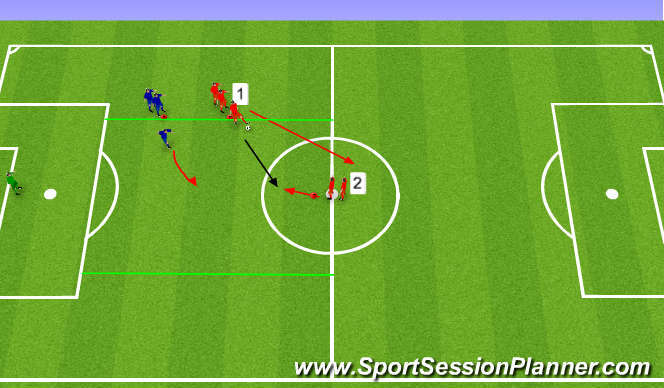 Progression 2: 2 v 1 with a recovery 2nd defender in the center channel. Defender 1 starts by defending agaisnt two attackers. Defender 1 must delay the two attackers until the recovering 2nd defneder can recover. When the attackers start the play defender 2 sprints into a recovery position to defend 2 v 2. Once two defenders have good position pressure cover techniques apply.